Our brand new Flowerframes are the perfect gift for an occasion like Valentine’s Day. The prettiest fresh blooms, expertly arranged inside a lovely soft grey box frame and personalised with a message from you. Why not email them your favourite picture of the two of you together so they can print it out and pop it into the frame when the blooms have faded. With 9 stunning designs to choose from, there’s bound to be one they’ll love. Our XXL Flowercards are 100% bigger than our standard Flowercards and never fail to impress for a big occasion. 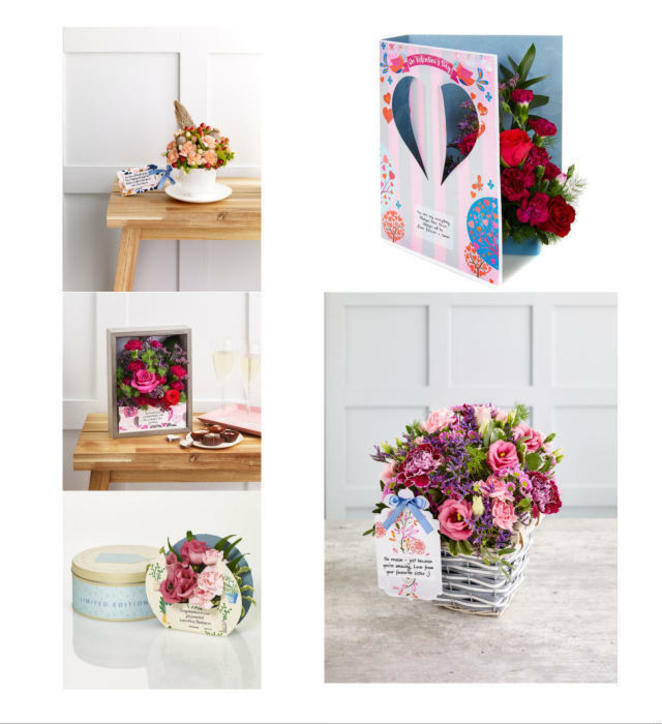 We have a gorgeous range especially for Valentine’s Day with pretty cards designed by British artists and featuring some exquisite arrangements of red and cerise pink blooms. Decide what you’d like your Valentine’s message to say and we’ll print it on the front of the card for you. Stunning arrangements of vibrant blooms in a pretty rustic basket, our Flowerbaskets really do have the WOW factor and make a lovely alternative to the traditional bouquet. Each one comes with a pretty tag and this is where we’ll print your declaration of love to your Valentine! For the Valentine who loves a touch of vintage, why not opt for one of our dainty bone china teacups filled with the prettiest selection of blooms. This is the perfect keepsake gift and the tea cup and saucer can be used again to hold things like jewellery when the flowers are past their best. Our gorgeous limited-edition cards in tins are another perfect option for Valentine’s Day. A beautiful Flowercard is presented in a pretty keepsake tin and you can choose from a range of colours including Cotswold cream, duck egg blue and pistachio green. Another lovely keepsake gift, the tins are the perfect size for holding all sorts of things from cookies to dressing table bits and bobs! Welcome to the official home of Flowercard. Read more about fresh flowers hand arranged in the British countryside, placed inside exclusive artist designed cards or tins wrapped in your words to create amazing personalised gifts.